Cross and Cutlass: Help me pick my Hero's Picture! Help me pick my Hero's Picture! Captain Reena Charlisse Hyde always gets what she wants. She wanted to be the best female pirate on the Caribbean and she is. She wanted to find the infamous mystical map leading to the fountain of youth and she knows exactly where it is. And now after searching across the Caribbean for the man she intends to marry she has finally found. Him. There’s only two problems. 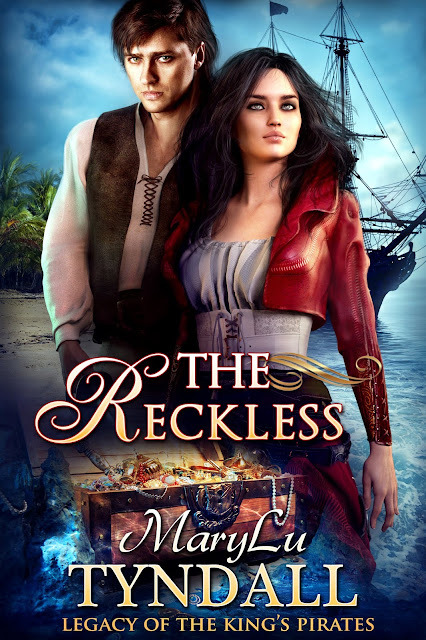 He doesn't want to be found and he's on board a Royal Navy frigate—the last place a pirate should venture. Frederick Carlton thought he was finally safe from the woman who held his heart—the woman with whom he’d pirated these seas—and loved intensely—for two years. But her sudden attempt to rescue him has labeled him deserter, punishable by death if caught. He had turned his life over to God and planned on being a preacher, but every moment he spends with Reena drives him deeper into a past he longs to forget. Mutinies, deserted islands, treasure maps, battles, traitors and villains send the couple sailing on one adventure after the other throughout the Caribbean in search of the Fountain of Youth. Frederick longs to escape the lure of the woman he loves. Reena longs for Frederick to love her again. But in the end, they will both have to choose between eternal youth or the lives of their families. Hi everyone, I'm out of town this week and next on vacation so I'm not able to collect all the data for my normal "Friday's Mad Mad World". However, I thought you might enjoy helping me out a bit. I've collected pictures from my readers of my next hero, Frederick Carlton, but I need you all to vote on your favorite. First some book news! I've finished the 2nd draft of The Reckless, and it is now in the hands of my capable editor, Lora Doncea. After she corrects all my mistakes, I will fix everything and read it over one last time to make sure everything is as good as I can get it. After that, I need to format it for Ebook and print and do a host of other tasks in order to get it ready to publish. I still am hoping for an August date, probably some time in the middle of the month. I'll let you know as we get closer. Frederick Carlton is the son of the infamous Captain Kent Frederick Carlton. He is 25 years old with dark brown hair and striking green eyes (which he inherited from his mother, Isabel). His personality tends toward the protector, savior type. He cares deeply about others and cannot resist putting in own life in danger for anyone in need. He is brave, strong, principled, honorable, chivalrous and kind. But he is also critical, demanding, moody, and has a temper. Though he spent a few years of his youth defying God and doing many things he shouldn't have, he has repented and is now trying to live his life for God. He hopes to join his parents someday in helping the poor and preaching the Gospel in the Caribbean. I've created a Pinterest board section with the current pictures I have of Frederick Carlton. I've numbered each picture 1-10. You task is to choose your favorite picture that best matches Frederick's character and leave your choice in the comments below. Next week when I return, I will tabulate the choices and announce the winner! If you have a hard time commenting on my blog (some people have mentioned this) you can go to my Facebook author page and leave your choice there! Omg great choices!! So hard to choose!! But I have to stick with my man Eoin Macken who I believe is #1 on the list? Good Luck!! Seriously can't wait for this book!!!!!! Definitely #10! Praying your vacation is relaxing and fun. I'm torn between #2 and #10. Sounds like a very interesting story and I can't wait for the release. I'm leaning towards #10 (though you really ought to keep Donaghue's Hook for some future swashbuckler, just saying. lol). Hard choice! My vote is #10! What a hard choice! My vote is for #2. Number 1, can't believe so many say 10, he looks mean and older. Your hero loves the Lord and wants to do missionary work someday. Yet he is handsome, gentle to helping others, yet strong and is known to have a temper. Nay. 10 is a sort of aloof look. Easily matches the age of 25 and the description/personality. I'd say #10 for sure! Couple of them are missing numbers, but the dude with the sword could be another possibility, or even #7. #6 and #8 don't look like they have a single demanding, moody or ill-tempered bone in their body. I'd pass on those guys for sure. Karla Tabor (fan who is happy for another book.) For me, #4 seems to fit the bill. #10 by all means, MaryLu! Glad you're back on the high seas. #1....Eoin Macken....have to go with Gwaine from Merlin!